Temporary staffing is a sound business strategy for companies that may not be ready to make a commitment to hiring, but have a need for skilled workers to complement their existing work force, or require fixed term support on business critical projects. 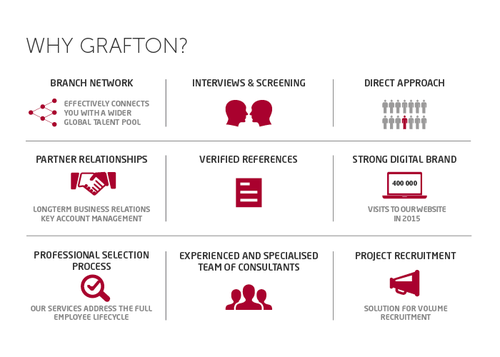 We supply over 4,000 temps per week across the Grafton network to major public sector, private sector, and not-for-profit organisations. Our temporary workers are deployed to a variety of sectors ranging from Industrial, Administrative, Business Support and Cucstomer Services to specialist professional skills in areas such Sales and Marketing, Retail, Administration and Customer Support, Accountancy, Banking, Funds, Technology, Transport and Logistics, Engineering, Multilingual and Scientific.